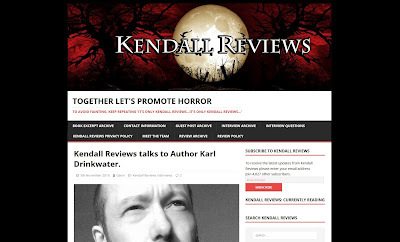 On 5th of November I was interviewed for Kendall Reviews, a brilliant horror-focussed review site. You can read the interview over on the KR site. I've also included a backup of the article below. I’m an ex-librarian who now writes and edits fiction for a living. I write in multiple genres, and my author clients also cover a wide range of genres, so I never get bored! In fact, I’m fascinated by the core elements that make a good story, regardless of genre. I’ve lived in Wales for 20 years but I’ll soon be saying hwyl fawr i Gymru and moving to Scotland. Playing the guitar and making music with friends; playing boardgames with friends; exercise; cooking; talking to the cat. Also anything connected to stories, so that includes watching films, playing computer games, and reading. I have eclectic tastes, so can’t pick a single album. But music is incredibly important to me. One of my novels, 2000 Tunes, had a main character and structure inspired by Manchester music, with chapters named after key songs and albums. 2000 Tunes will be getting a new edition in 2018. I can’t say. :-) I’m chairing a judging panel in a major international horror competition, so am reading horror every single day. I go for the middle approach. Over a year or so I come up with ideas for characters, plot events, settings and so on (as a background thing while working on other books). Then when I come to write the new work, I go through all these ideas, discarding some, connecting others, until I have a rough outline of the story and the major events. But I don’t fill in every detail. That way the characters can lead, and surprise me, and take things in different directions. It means that I have a structure so am not wasting my time writing randomly; but it is also exciting to write, because I don’t quite know what is going to happen when all the characters face the different situations. A book should be as much fun to write as it is to read – joy comes through in the words. I research in every way possible. It depends on what the topic is. Some research is from life, and remembering how something felt when it happened. Some is from experiences – if I want to write about being freezing cold, then I’ll stand in a freezing shower until I “get it”. If it’s a topic that can be researched such as astrophysics or homelessness, then immerse yourself in it. For the horror genre, having bad dreams helps. I’m never as happy as when I have a heart-pounding nightmare about being pursued by eyeless crab men to serve as pre-digested food for acidic lobsterfarian maggots. My process usually involves a year or two of idea gathering and reading while working on other projects; then more intensive research in preparation for the first draft; then research during the rewriting process, making sure facts are correct (especially anything I made up on the fly so as not to break the flow). I like to have some experts as beta readers, who will spot any mistakes in their specialist areas. Yes. I think it’s the least I can do when someone took the time to write it. I discount the ones that are obvious trolling or mistakes (luckily I don’t get many of those, but I know some authors who suffer from it a lot). I pay attention to any criticisms, and evaluate how much I agree with them – that may affect future books, or new editions. I am grateful that most of the time it is just a case of reading lovely words and praise. I share reviews on social media, often highlighting a key quote. I also include quotes from some of them on my web page about the book, linking back to the source. A few of my favourites will make it into blurbs, covers, editorial reviews, marketing materials etc. Most people have to write about ten books to get a handle on the craft of writing. There are shortcuts, such as working with really good editors. All books need editors, and proofreaders; beta readers and early reviewers are also lifesavers. Always be willing to look at criticism and evaluate it without your own feelings getting in the way. Some of my favourite editors are the ones who tell it straight. It smarts at the time, but the key thing is that you remember it and your writing is better next time. And there’s no end to it, where we are perfect writers – we’re always learning – but it does get easier with experience and professionalism. Also, don’t do it all alone. Join networks and organisations; make friends with other authors. Listen. Read. Do courses. Seek feedback. Book three or four could be your big hit. Whatever the reader wants. They’re customers. Lovely, intelligent, huggable, awesome customers. It’s why I don’t make my books exclusive to Amazon, or add DRM (when I have the choice) – let the reader choose where to buy their books, and let them convert between formats and devices if that’s easier for them. It’s our readers and fans and superfans that give us our living. Lost Solace was my first full-on sci-fi novel, and it’s been a real success. It began as a short project to tie up a NaNoWriMo, but I fell in love with the story and kept writing, and the short story ended up as a novel. Reviewers seem to like the fast pace of it, since the novel is almost real-time, with action and suspense and all sorts of creepy goings-on. They also praise the main character, Opal, who kicks arse and is backed up by an artificial intelligence spaceship called Clarissa. They’re a great team, and for most of the novel they are the only two speaking characters – something I wasn’t sure would work, but people seem to love it, and their core relationship carries the emotional heart of the book. Although Lost Solace is classed as sci-fi, it’s the kind of sci-fi you’d get if you mixed the films Alien, Pandorum and Event Horizon, because it is really a haunted house story in space. I think that’s why I had such fun with it. A sequel to Lost Solace, called Chasing Solace. I’m having a blast writing it – the first draft is 80% complete, and I have beta readers lined up, all wanting to be the first to find out what happens next. :-) I also have a collection of literary/contemporary stories with an editor. They’re tales about love, but in unexpected ways – often dark, sometimes absurd, sometimes incredibly tense. I’ve already mentioned a revamp of 2000 Tunes, which is with a different editor. And I am working with different audio producers/narrators for the audio books of Cold Fusion 2000 and Lost Solace. I’m always in awe of how talented these people are! And it ties in to making my work available in whatever way the reader likes. Once all that is out of the way I have two sequels to other books planned, and three new works, though it will probably be 2019 before I get started on any of those. KR: Thank you very much Karl. First the birds went quiet. Then the evening sky filled with strange clouds that trapped the heat below. Now Callum wakes, dripping in sweat. Something has come to his isolated Welsh farm. If he’s going to keep his family alive during this single night when all hell breaks loose, he’ll have to think fast. And when he sees what he’s facing, he suspects even that may not be enough. This blast of a book can be read in one nail-biting session.